Today we are back with another update of the kalmstrom.com product, Kanban Task Manager. The two SharePoint editions of Kanban Task Manager have been updated with two new views and a few more features. Kanban Task Manager helps a workgroup to cooperate on projects and tasks in SharePoint. 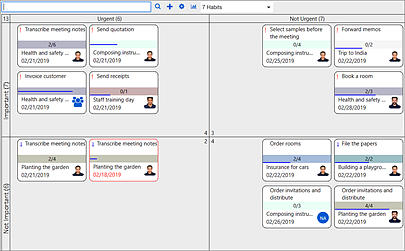 Team members can see the work process on a virtual kanban board and drag and drop task cards to different phases as the work proceeds. Along with visualizing tasks on a kanban board, the software gives various other possibilities to make the work more effective. 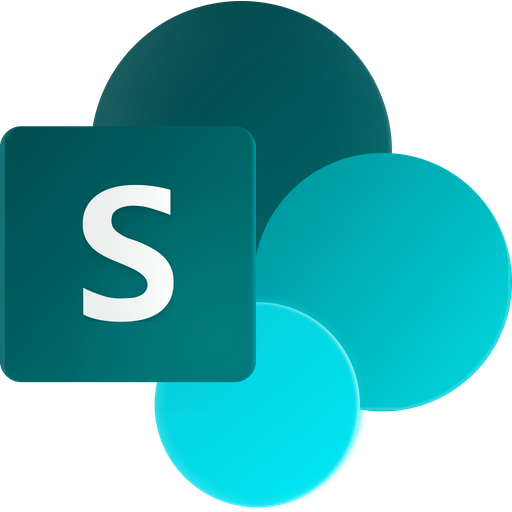 Kanban Task Manager comes in two SharePoint editions: Sandboxed and Add-in/App. For several years Kanban Task Manager has helped many organizations and teams to manage their tasks. We get a lot of positive feedback and suggestions, and this is the reason we update the solution quite often. These suggestions have played a major role in enhancing Kanban Task Manager and making it a powerful product on the market. Apart from the kanban view, Kanban Task Manager has several additional views. These views help users get an overview of the tasks based on week, month, year, project, responsible and more. When there are too many tasks on your to-do list, it might become difficult to know which task you should focus on first. There is often only a small difference between important tasks and urgent tasks. This is a challenge in many organizations who have multiple projects with tight deadlines. To help subscribers overcome this dilemma, a ‘7 Habits’ view has been added in Kanban Task Manager. The name of this view comes from the renowned book ‘7 Habits of Highly Effective People’ by Stephen Covey. For the third important habit, “Put first things first”, Stephen Covey refers to the Eisenhower principle of ‘Urgent-Important’ Matrix on how to prioritize tasks. When tasks are dragged between the quadrants, the importance and urgency values will be changed automatically. For better time management, most organizations want to have an overview of how much time is spent on a specific project or task. The new ‘Hours Open’ feature calculates the actual time a task was open. I use the word ‘actual’, as you can set your organization’s working day, service hours and lunch break in the Kanban Task Manager settings. Based on these factors, Kanban Task Manager calculates the total hours open for each task and displays it in the task’s details pane on the kanban board. You can also study the Hours Open in the Excel reports generated by Kanban Task Manager. Two new buttons have been added to the details pane in the updated version of Kanban Task Manager: ‘Copy’ and ‘Versions’. Now you don’t have to hassle with creating new tasks each time. Instead you can select a task that is similar to the new one and copy it. When you click on the ‘Versions’ button, you can study the task’s version history. If managing multiple tasks and projects is a challenge in your organization, I recommend that you try Kanban Task Manager. You are welcome evaluate the solution for 30 days without any obligations. Our Support team is here to help you, in case you run into any problems during your evaluation period. All the kalmstrom.com solutions are licensed with a subscription, and so is Kanban Task Manager. Feel free to contact me or my colleagues at the Sales department, if you have any queries regarding the product subscription. Would you like to see the total of sums or numbers both vertically and horizontally in a SharePoint list? That is possible if you let a flow or workflow calculate the row total and let the SharePoint built-in Totals view show totals for the columns. I have described how to do it in two Tips articles on the kalmstrom.com website. The SharePoint ‘Totals’ feature can be used to summarize the values in a column. It can also calculate other values for number columns, like average, maximum and minimum. The result of the calculation is shown on top of the column that is calculated. The Totals value is however only displayed in the standard mode of the classic interface, not in the Quick Edit mode or in the modern interface. 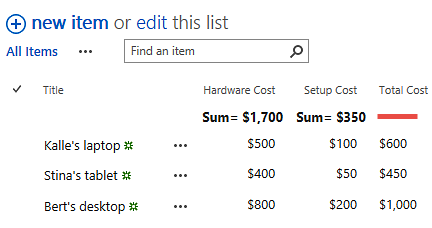 I hope Microsoft will soon add Totals to the modern interface too, because it is a really useful feature. If you want to use totals, you cannot use a calculated column, because it is not possible to use the Totals view on a column with calculated values. This means that you cannot get the total for the 'Total Cost' column in the image below, as that is a calculated column that gets its values from calculations of the values in the two other columns. Instead, you can use a currency or number column and let a flow or workflow do the calculation. Then it is possible to use the Totals view, and you will have totals both vertically and horizontally. If you want to let a flow do the calculation, use an expression that calculates the sum of column values for a list item. You can create such an expression by entering the function ‘add’ and then the dynamic content for the columns that should be calculated. Separate the columns with a comma. You can of course also let a workflow calculate column values. First, create a local variable that gets its value from a ‘Do Calculation’ action. 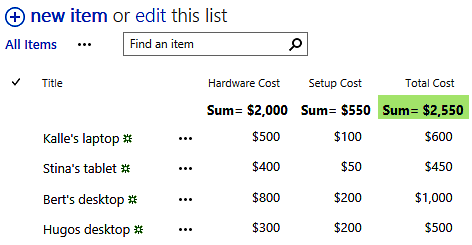 Then use this variable in a 'Set Field in Current Item' action to update the column with the totals value for the created or changed list item. 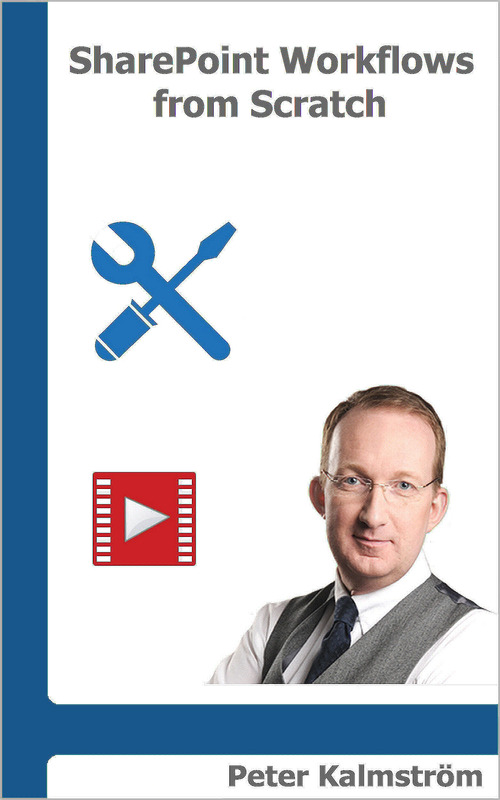 I have created the articles and the demos above for my books on SharePoint automation. SharePoint Flows from Scratch has already been published on Amazon, and I hope to release SharePoint Workflows from Scratch this month.